Seven Models of Series 600 and Series 700 valves offer choices in vessel and gage connections, equalizer tube availability and maximum steam pressure services. Refer to the Model Selection Guide for individual model features to meet your specific installation requirements. 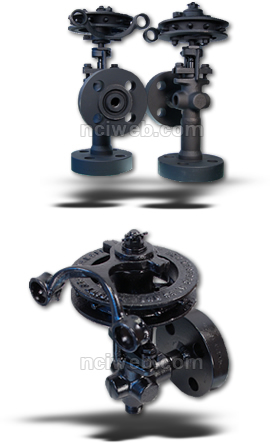 All chain wheel operated models are of outside screw and yoke design. Forged steel body to ASTM A 105 Specification. Type 303 stainless steel stem. On Series 700 models only, one-piece 420F stainless steel replaceable seat (Figure 24) is secured by identical two-bolt packing yokes. Single-pitch stem thread allows easy valve operation by chain wheel. Lower valves provide 3/8" pipe connection and female socket weld connection for blowdown. Note: Female socket weld connectors are not included when valves are to be welded to water columns. To specify for the above applications add "C" to model numbers. Example: Model SG777 (with socket weld connectors) becomes Model SG777C (without socket weld connectors). Live-Loading Equalizer Max. Net Wt.